Vietnam House, a downtown Saigon restaurant that first opened in 1992 in a 1910-built colonial French building, has re-opened with a celebrity chef at its helm and one of the country’s most dynamic hospitality companies, WMC Group, leading the way. WMC Group, which opened The Reverie Saigon hotel in September 2015 to worldwide acclaim, and Chef Luke Nguyen have teamed up on the Chef’s first restaurant project in the country. 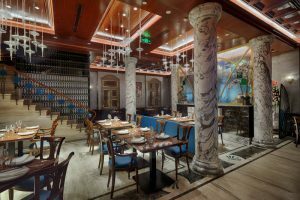 Though the restaurant’s facade on the city’s famed Dong Khoi Street stays true to its French colonial roots, the restaurant’s interior is an exploration of the same lavish design that’s informed the interiors of the nearby Reverie Saigon. 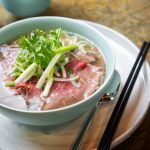 Opened originally as Cafe L’Imperial in the early 1900s, the first Vietnam House opened in 1992 and quickly set a standard for the atmospheric appeal of high-end Vietnamese dining. The latest incarnation will elevate the experience through its posh decor and Luke Nguyen’s distinctive culinary vision. 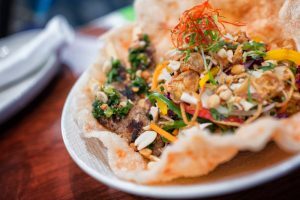 The Australian-born Vietnamese chef brings numerous accolades and experience to his latest endeavour. Nguyen has hosted the popular ‘MasterChef Vietnam’ television program in the country in addition to making guest appearances on the show’s Australian edition. He has also authored several award-winning cookbooks, opened a number of popular restaurants in Australia, and led armchair travellers through culinary journeys of the Greater Mekong, Vietnam, United Kingdom and France, with travel shows that have aired in over 150 countries. “With Vietnam House, I’m bringing together the strands of my heritage, my journey of discovery in Vietnam and my career in the culinary industry to make this place something very special,” said Nguyen. It’s through his exploration of Vietnam that the chef crafted a menu that spans the length of the country. Familiar favourites, likebanh xeo, a crispy Vietnamese-style savoury pancake filled with local produce and fresh tofu, sit alongside elevated versions of classics such as Wagyu Beef Pho and Wagyu Beef La Lot, succulent Japanese beef served with betel leaves, herbs and angel hair noodles. Nguyen’s influence from Down Under comes through with fusion dishes such as Australian pork ribs slow-cooked in young coconut juice and served with carrot puree and choy sum. Seafood also plays a prominent role on the menu, from char-grilled lobster in a Phu Quoc pepper sauce, an island in Vietnam’s south famous for its spicy pepper, and soft rice paper rolls with seared sesame salmon. Vietnam House acts as a local complement to The Reverie Saigon’s dining venues, which highlight the best in French, Italian and Chinese cuisine. As with Vietnam House, the country’s only member of The Leading Hotels of the World has collaborated with culinary stars from the respective countries to ensure each cuisine’s authenticity.